Gone Girl is a new drama/mystery/thriller film directed by David Fincher and based off the 2012 Gillian Flynn novel of the same name. Ben Affleck and Rosamund Pike star while Neil Patrick Harris and Tyler Perry are featured in supporting roles. Even though I never got a chance to read the book, I must say I was extremely excited for this movie. I had heard nothing but overwhelmingly positive reviews, plus David Fincher is one of my absolute favorite directors. Some of his most famous works such as Se7en, Fight Club, The Social Network and The Curious Case of Benjamin Button are amongst my all time favorite movies. With his most recent film being 2011’s The Girl with the Dragon Tattoo, I was really looking forward to seeing what he would bring to the table this time around. I can now say that Gone Girl exceeded all of my lofty expectations and is right up there with my personal favorite David Fincher films. Gone Girl is a complex, detailed film that is fueled by a string of signature David Fincher plot twists all throughout. Having said that, I will keep my summary somewhat brief to avoid any spoilers and allow you to fully experience this unique film in its entirety. On the day of his fifth wedding anniversary, a man named Nick Dunne (Ben Affleck) reports that his wife Amy (Rosamund Pike) has gone missing. What follows is a constant pressure felt by Nick from police forces and the media alike. His eventual lies, deceit and overall strange behavior begin to change the public’s opinion. Before he knows it, the rest of the world and us as an audience keeps considering the dark idea that Nick Dunne actually killed his wife. Overall, I had a great time with Gone Girl despite its rather lengthy two and a half hour runtime. It managed to keep me fully interested for every minute largely due to the intrigue and mystery of the story combined with the seemingly endless string of unexpected plot twists and dark humor. Furthermore, Ben Affleck and Rosamund Pike turned in outstanding performances in their lead roles. 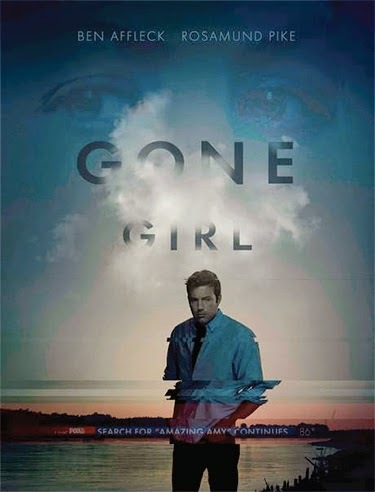 I would not recommend this movie to everybody simply due to its very dark subject matter and occasional graphic images, but if that doesn't bother you, you must see Gone Girl; David Fincher has managed to craft yet another masterpiece.